The major indexes are making a nice downtrendline. SPY and DIA are making it and if they break above it, the major indexes are very likely to move higher and challenge the old highs. 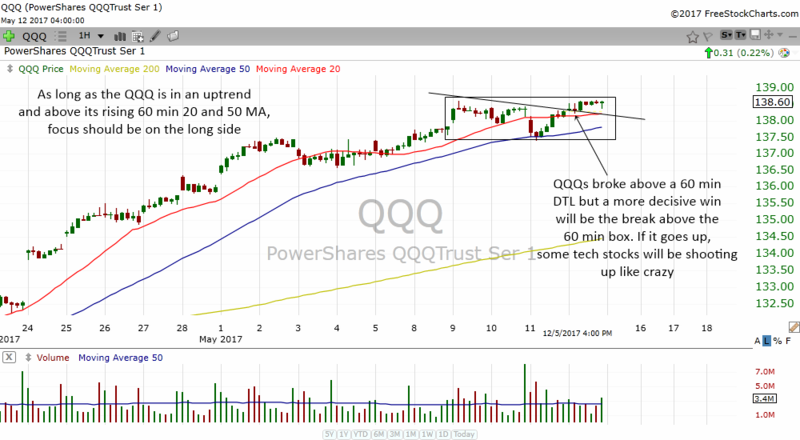 The QQQ's meanwhile are forming a box pattern and a breakout above will bring most tech stocks higher. As you can see from the 60 min chart of DIA above, the ETF is forming a very very nice downtrendline to break. 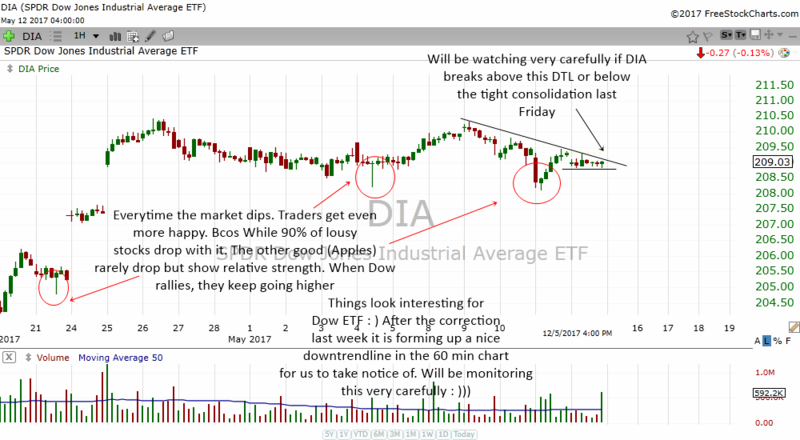 If the DIA moves above this, there might be a very smooth rise upwards and Dow may soon challenge the old highs and even move higher forming new highs. Whether it will be able to make all time highs in one day or this week I really don't know. But breaking the downtrendline will represent a good shift from bearish mood to bullish mode. This is when most market commentators will once again say how great the stock market is once again. QQQ which is much more stronger than the SPY and DIA is forming a very nice box which if it breaks will send many many tech stocks higher. When the QQQ leads the market and moves higher before the rest of the market, it is usually a very good sign for the general markets. A stock market lead by tech stocks is healthy and will usually move higher. We continue to remain bullish as long as QQQ is above its rising 20 and 50 MA. Since QQQ has formed many layers of boxes, a correction in the QQQ and general market will not be so smooth. Meaning, the path of least resistance is still upwards and even if it corrects, it will give us time to get out. 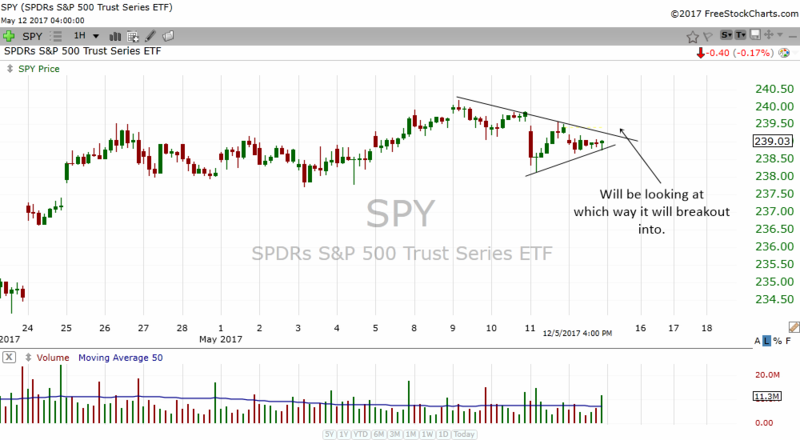 SPY is forming a somewhat triangle pattern. A break above will be very good. Meanwhile across the pond, the FTSE 100 is making new highs and after it broke the downtrendline, the index moved higher. A rising stock market before the election in UK is good for Theresa May which is from the incumbent party. Oil has made a short term bottom and it has met the pennant target. I believe it will move sideways for awhile to absorb the supply from the left. It is very likely to move higher looking at the charts. There is support beneath which a 60 min box has formed and this will keep the bears away for awhile even if it drops. Looking at the long term charts of oil above, we can see that oil is bottoming and if it goes above the weekly charts, it is very likely the reverse head and shoulders bottom in the weekly charts's target will be met in the future. But this is a weekly charts, so patience is needed. If you like this stock market commentary, do come back every day for more. I comment on the stock market almost every day.